So, it's great to look at the most recent pictures from Bhola and see the quiet progress that continues to make a sad or sick child just that bit happier. All the children now go to the local school for some lessons and in addition, the English teacher visits the boundary every day, and Ali teaches lipreading. We have a new combined resident teacher (for special lessons) and office manager, with particular responsibility for the accounts. Nozrul knows the community well and is already streamlining all systems! Salina, mother of a little girl very disabled with cerebral palsy is now in charge of physiotherapy. There are at least 8 resident children and teenagers with CP or other balance and mobility problems, and many, many outpatients. Salina, assisted by Supia and Rozina, both of whom are blind, is giving morning and evening treatments, and it gives a real and valued role to the two visually impaired young women. Conversion of one of the buildings has allowed for big and bright physio room. Valumia, the vegetable garden and 'fish pond' is flourishing, although this year there is little surplus produce to sell; a combination of poor weather and a healthy community who need to eat most of the food produced! 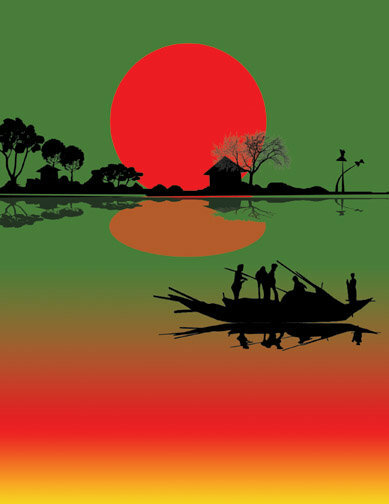 And I'll finish with a reminder of the colours and the emblem of Bangladesh: the red sun setting over the green fields, which forms the basis of the national flag.